OR7, the lone gray wolf from a pack in Oregon, crossed back into his home state yesterday after two months of wandering in Northern California. 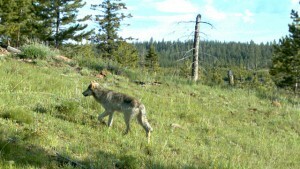 OR7’s trek made him the first wolf in California in almost 90 years. Officials say it’s possible the wolf will continue to use both states. With OR7’s arrival, California has been thrown into a national debate about how to manage wolves. Environmentalists want to see a wolf population restored in the state. For others, OR7 is not a welcome visitor. In Lassen County, where OR7 has spent the bulk of his time, wolf opposition is heating up. At a recent county board of supervisors meeting in Susanville, a town in the state’s rural northeast corner, Fish and Game biologist Karen Kovacs takes the podium. “What we’re here today to do is just to share what we know about wolves in California,” she says to the crowd. Kovacs’ agency gets daily downloads about the two-year-old male wolf’s location through its radio collar. “Are there other wolves in California? That’s a $64 million dollar question,” she says. If there’s one thing Kovacs has learned since OR7 arrived, it’s that wolves make people emotional. 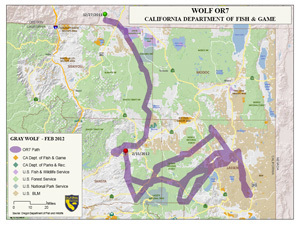 For several weeks, Kovacs and other wildlife officials have attended a number of public meetings about California’s wolf. In the state’s northern counties, the reaction has been vocal. “The protection afforded something that doesn’t belong here in the first place doesn’t make any sense,” says Susanville resident Len Grizwold. “Be cautious, folks. They’re here to tell you there’s nothing to worry about,” says another resident. The reception from county supervisor and rancher Bob Pyle isn’t any warmer. “I really don’t care what it is. If it’s killing my cattle, I’m gonna kill it,” he says. That sentiment has followed wolves from the moment they were reintroduced in the West almost 20 years ago. In states like Idaho and Montana, where wolf populations have rebounded, there’s been an all-out war. 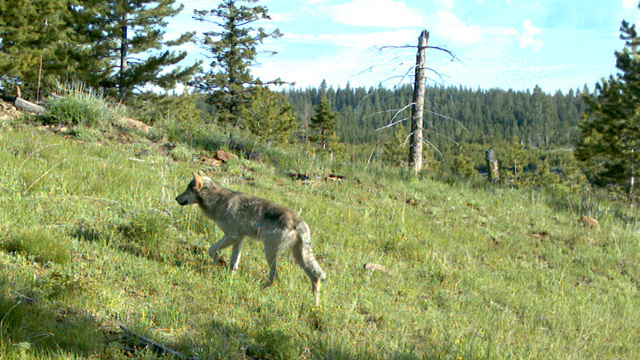 Ranchers and hunters say wolves kill too many livestock and elk. Environmentalists see the wolf as a key part of a healthy ecosystem. With OR7’s arrival, that debate has come to California. In a quiet pine forest outside of Susanville, Kovacs and Fish and Game biologist Richard Callas walk through a light layer of snow. OR7 crossed a major highway nearby a few weeks ago, not far from where California’s last wolf was trapped and killed in 1924. Click to see a larger map of where OR7 has traveled. “The way we find his tracks is because they’re pretty darn big,” says Kovacs. OR7’s exact location is secret to protect the wolf, but once he leaves an area, Kovacs and Callas go in to see what he’s been eating. “We know that OR7 has fed on two deer. We don’t know if he killed them or scavenged them,” Callas says. In other states, it’s taken about 10 years for a pack to be established after the first wolf showed up. But biologists aren’t sure how successful wolves will be here. “Our elk population is smaller than some state like Montana, Colorado and Wyoming. Our deer numbers were lower than they were,” he says. Since Oregon’s wolf packs live hundreds of miles from the border, it could be some time before another wolf wanders this way. But for the Department of Fish and Game, that may not matter. Groups on both sides are calling for some kind of plan to manage wolves. OR7 wandered close to Willow Creek Ranch outside of Susanville. 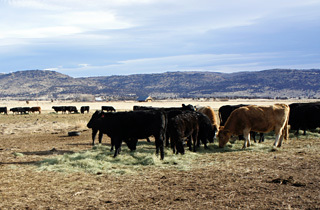 On a cold morning at Willow Creek Ranch outside of Susanville, Jack Hanson is getting ready to feed 300 hungry cattle. A few weeks ago, OR7 wasn’t far from here. “About 17 or 18 miles as the crow flies,” says Hanson. Hanson says it’s not OR7 that’s he’s worried about. It’s that wolf populations could grow. In other states, some ranchers are trying out tools to deter wolves, like special fencing and loud noises. Some even get text messages when wolves are close. Wolves are currently protected in California under the federal Endangered Species Act, but several environmental groups are petitioning the state to protect them under California law as well. That would require the Department of Fish and Game to figure out how many wolves belong in California and how they’ll recover. The federal government is also considering whether to specially protect California wolves. Populations in Idaho, Montana and parts of Oregon and Washington have already been taken off the endangered species list but this week, the agency recommended removing protection for wolves in some of the remaining parts of the lower 48 states. California wolves may still be protected, however. Fish and Wildlife is considering whether to specially protect wolves in parts of Oregon, Washington and California. If so, the agency would consider writing a recovery plan for what would be known as the Pacific Northwest population. That decision is due by September 30th. The question is: can California avoid the battles that other states have seen? “No, I don’t think so,” says Ed Bangs, the recently retired Wolf Recovery Coordinator at the U.S. Fish and Wildlife Service. He’s been in the middle of the Western wolf debate for two decades. Just 30 years ago, there were only a handful of gray wolves in the West. Today, there are more than 1,600. I saw a wolf in California in the winter of 1978-1979 crossing Highway 88 on the Carson Pass, southwest of Lake Tahoe. Everyone I told thought I saw a coyote but no-way, this was over 200 pounds and had huge canine teeth that would rival a lions. No wolf has ever weighed near 200 lb. The biggest arctic wolf hit about 173, and all those who study or know wolves, know that the 150 lb wolves of AK and the high north are replaced by smaller ones as one goes south. By AB, BC, and MT/ID, you are looking at 120 lb males with females commonly 2/3 to 3/4 that, as everywhere else. By the time you reach NM/AZ and Mexico, the Mexican Wolves weighed in under 100 for males and less for females. As Ed Bangs implied, there is really no room for human fantasy in real life, real animals, especially a species so persecuted by immigrant Euroamericans. The wolf was here in the millions, along with bison, elk, pronghorn deer, in greater millions, It took guns and selfish, solipsistic ignorance to change that. Cease to post false garbage. Cattle ranchers should be worrying about disease killing their cattle, not predators and especially not wolves. Better than 94% of cattle deaths in 2011 (USDA report) were due to non-predator causes, respiratory and digestive illness among the top reasons. Stop eating BEEf Everyone that will get them when the beef bottoms out then hello maybe they will embrace all animals as being a part of our UNIverse.. IF you eat meat then so can they. ITs wrong the People have a one sided view point that nothing else can survive but man. AS for me I do not want to live in a world with just cockroaches… think about it just wrong all the way around. LEave our wildlife alone… most wolves have no desire for cattle.. and if they do then so what.. you eat meat? Most cattle die from illnesses and diseases, not from wolves.